It’s only been a couple of weeks since Halloween, but it seems like so long ago. Like most holiday celebrations, after weeks of preparation it’s gone in a blink of an eye. The past week has been a bit of an enigma, I’ve got Christmas ideas in the works while simultaneously scrapbooking some Halloween photos (could be dangerous, we’ll find out). I thought I’d share a trick I use in many collage projects. It creates an interesting space to add layers and all the elements that help tell your story. 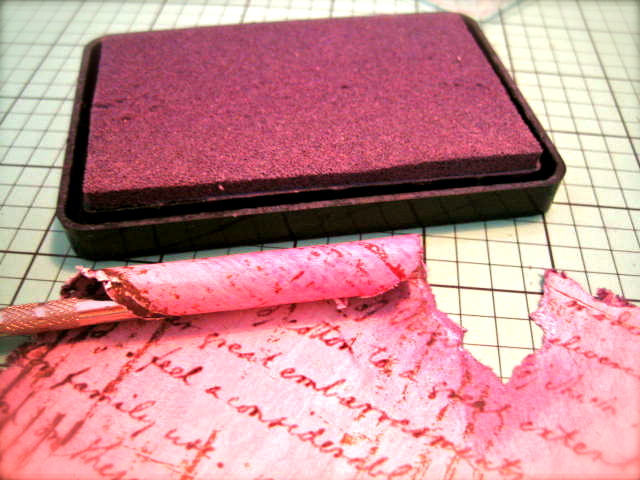 It’s simple, you just tightly curl up the corners of your scrap paper with a pencil. I did it here, on the bottom left and top right. I also like to ink and distress the edges too. It all adds texture and that’s the goal. Here’s all the stuff I tucked under this rolled corner. 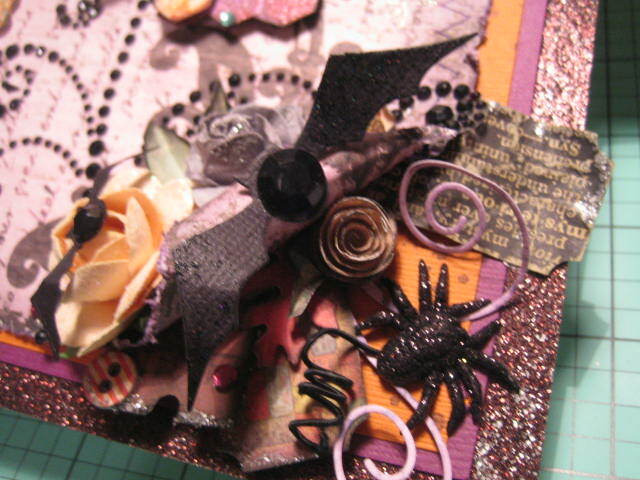 There are tendrils, bats, rhinestones, old tickets, roses, spiders and who knows what else. The front of the rolled corner is also a handy crevice for all your goodies. 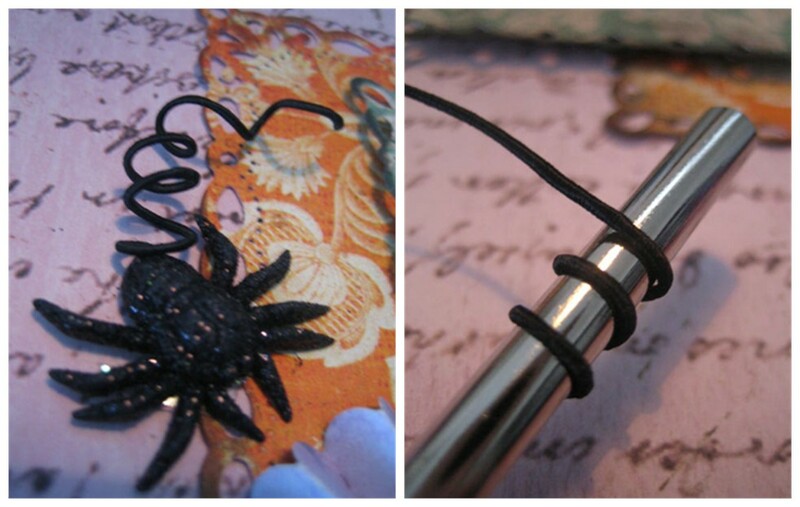 Bonus trick: a simple black wired cording adds the suggestion of movement for this little spider. You can use the same trick with bumble bees, birds, butterfly’s and really anything you want to imply movement with. Even a little car a baseball or a hockey puck. I’m lucky to have the luxury of time to happily putter in my craftroom. That’s great for me because it’s all in the details. 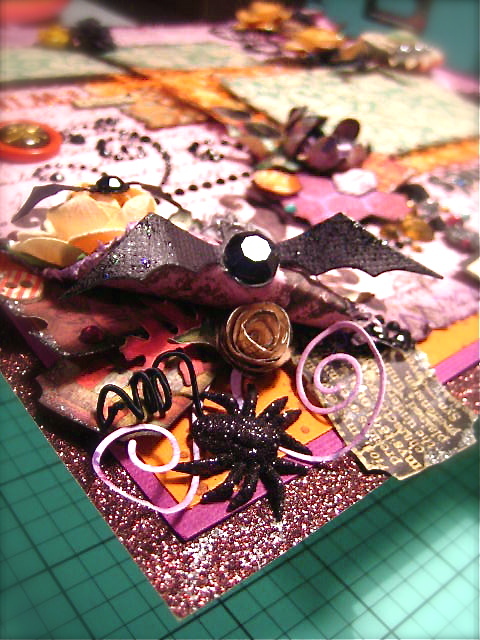 Is there a trick you use in your Scrapbook pages? Wow, Erin’s Christmas cards are looking really really cute. I bookmarked for a peak around. Thanks for the link and for that nice complement. I have to get back in there. I have two christmas things going and times a ticking. Hope your day is fab! Wow, this is impressive. It’s absolutely beautiful. You’re so creative. Hey thanks Sheryl, I really find it relaxing too…not that my life is stressful…LOL. Oh my you are so gifted! I love this page and all the remarkable details. I just “came back” from your Pinterest Board. I nearly got lost, but I saved myself just in time. How do you preserve these three-dimensional pages over time? They’re stunning works of art. Holy cow, well thanks so much! I sure felt challenged with these colors, I wouldn’t usually do orange and purple. But it seems good for Halloween. I’ve got a couple of frames I rotate projects thru. I have a little gallery on the cabinet in the craft room. Like an ‘inspiration corner’. Then I pop them into a plastic sleeve and into an Album. I’ve been buying the 3 ring 12 x 12 Album in Brown from Micheals for 3 or 4 years when I have a 50% off coupon. I like them all to be the same on a bookcase. I would prefer cream colored but they don’t seem to make one. Sometimes when I’m stuck I’ll look back. Absolutely, PINN away…I’ll come over to your board and see what I can PINN too. Pinterest is a great inspiration isn’t it. 🙂 Thanks again Marlene! That’s me. I don’t know how to put the pinterest button on. Flossy fussbudget. It’s a long story. Copy the info shown beside the ‘Follow me on Pinterest’ Button and paste it into the ‘Text Widget’ you left open at your blog (on your other open window’. Ok, how does all that fit in a scrapbook and close? It looks like it should just be framed on the wall. Too pretty to hide in a scrapbook. Love it all. Ha, you’re right, I don’t really make them to go in a regular scrapbook. I display projects on my cabinet in the Craftroom for a time, then I pop them into an Album. 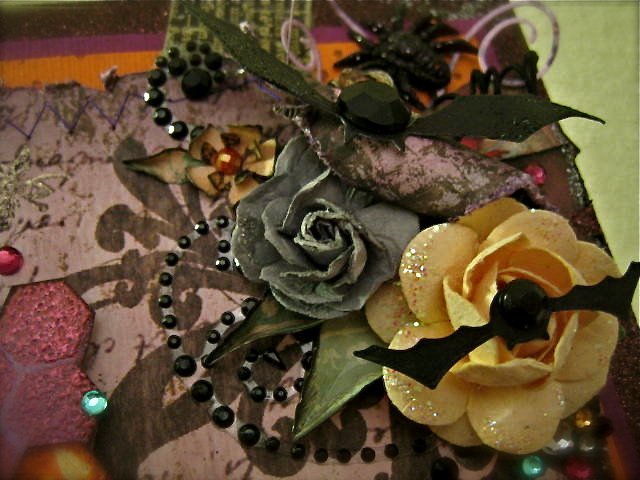 I have several with Collages I’ve made in the past. It’s like a little gallery to inspire me. 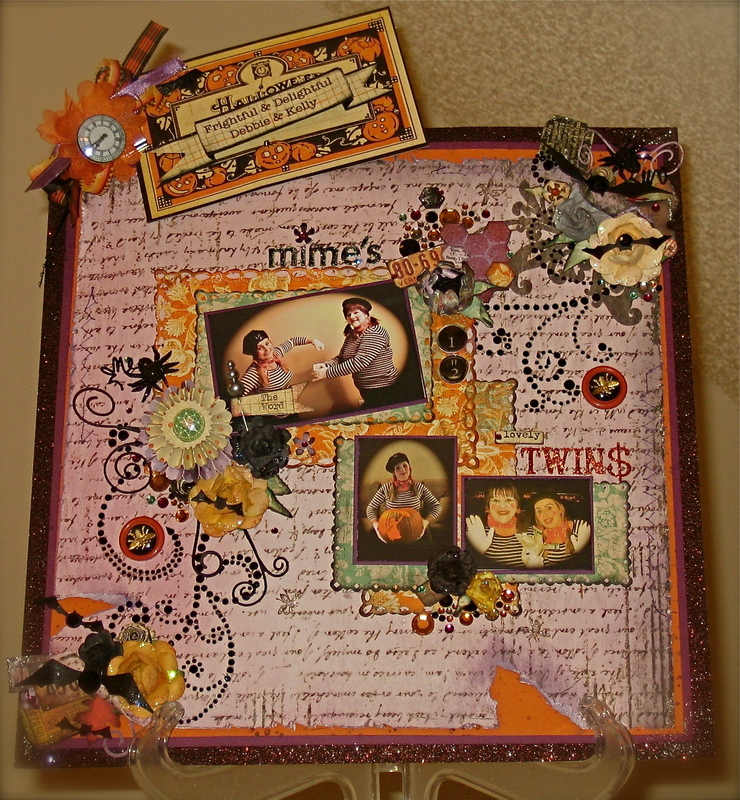 Do you make scrapbooks Marlene? 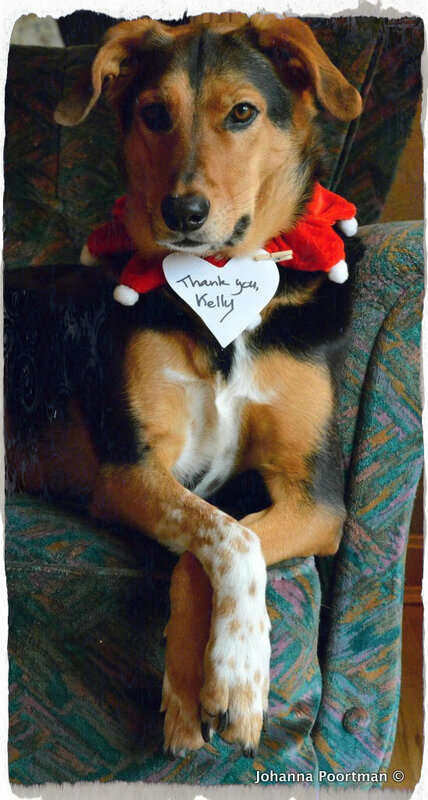 Thans so much for your lovely message! Good ideas and they look pretty cool. Thank you Steven! I also keep ‘photo albums’ for pictures I want to print, like our trip to Europe. But keep most photos in Albums on-line. These little projects keep me entertained and it’s a fun way to be creative too. The results are lovely! Those details must take so much time to get right. I do move things around and some till they look balanced. I generally have an loose idea about the layout b4 I start. I try an use groups of three. 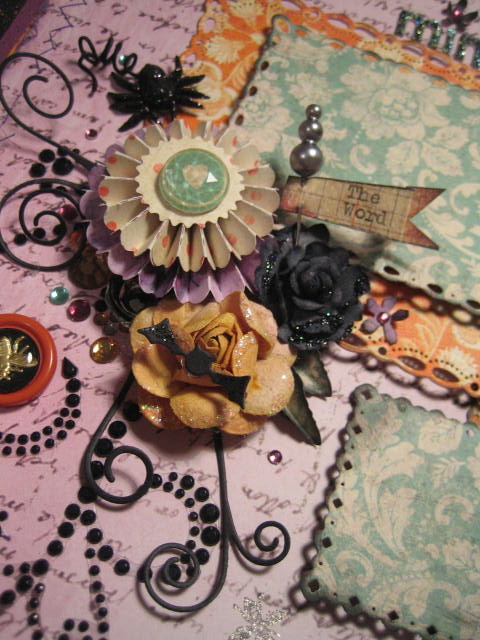 Three photos, 3 collage groups, a three roses cluster, etc. It’s just like gardening. I guess this was 4 days, off and on, a couple of hours at a time. Thanks you so much, I really appreciate your compliment. Amazing! Love, love, love all your ideas! You’re right, it IS all in the details and what beautiful details they are! I love all of your work & designs!